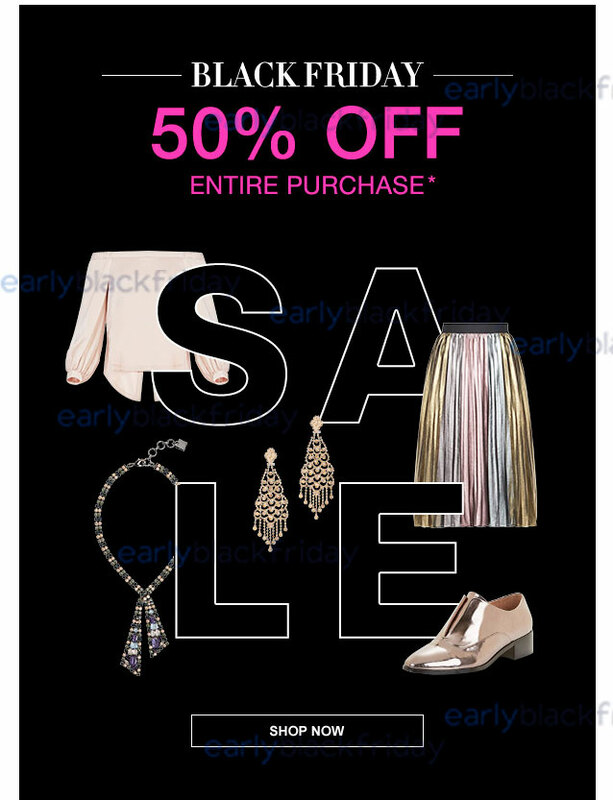 During the BCBG Black Friday sale for 2019, we predict that they will offer 50% off all items on their website, including all dresses, tops, pants, shoes, and accessories. They are also likely to include free shipping on all orders. Whether you have an upcoming wedding to attend or a corporate event has lined up, BCBG.com is the place to shop this Black Friday for all your holiday ensembles. The 2019 BCBG Black Friday deals have not yet been released. While we don't have the Black Friday ad for BCBG.com yet, below are some of their historical deals which will give you a good indication of what you can expect during this year's sale. Black Friday in 2016 indeed proved to be happy Friday for the shopaholics as BCBG announced a whopping 50% off on their entire stock during the BCBG Black Friday sale. From the trendy accessories to designer dresses ranging in different categories, everything is available at half price this Black Friday. Another great thing about this deal is that they are including free shipping on all orders too so you can get your items delivered at your doorsteps without having to pay anything extra. 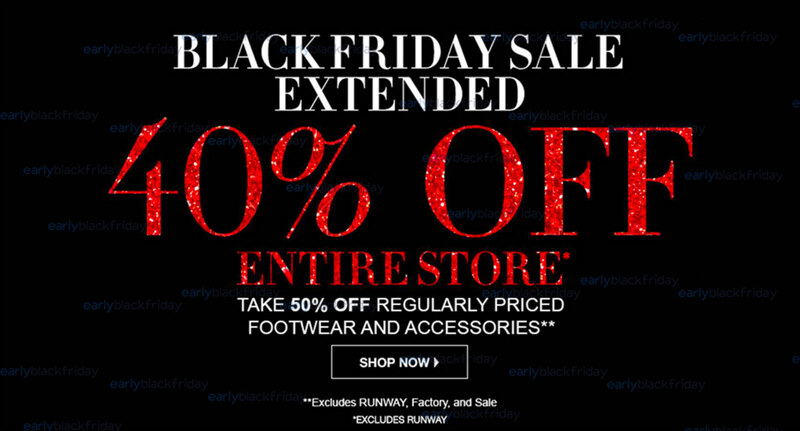 For 2015, BCBGMAXAZRIA's Black Friday sale has been extended to include 40% off every item in the store. Also, all regularly priced footwear and accessories are 50% off! These discounts exclude items that are already on sale in the runway, factory, or clearance sale sections (so no double dipping!) but it's still a great deal that we expect lots of fashionistas will take advantage of. 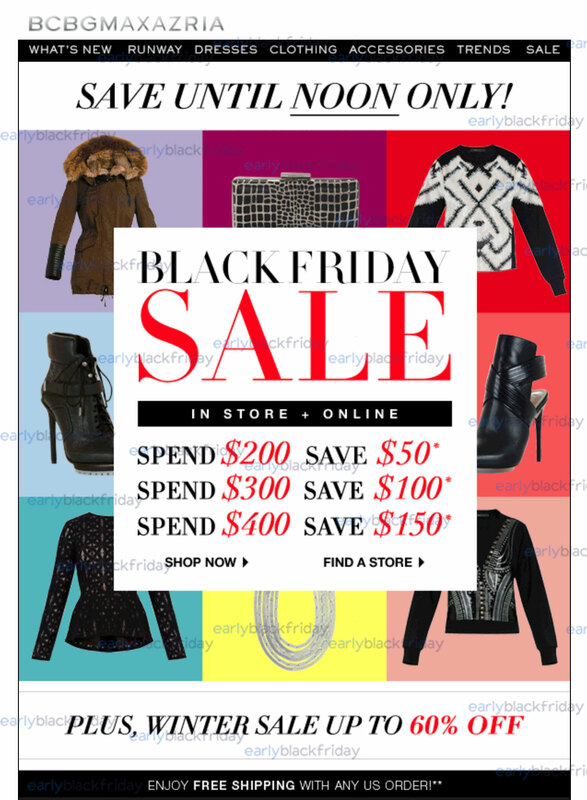 The BCBGMAXAZRIA Black Friday sale in 2014 was available both in stores and online but only until noon that day. They are offering discounts of $50, $100, and $150 off when your purchase is over the $200, $300, and $400 amounts respectively. Apart from this discount, they also are offering discounts of up to 60% on their entire winter stock. With BCBGMAXAZRIA stores located throughout the US, this is definitely a place to check out if you're looking to get a new fashionable dress or top this Black Friday.